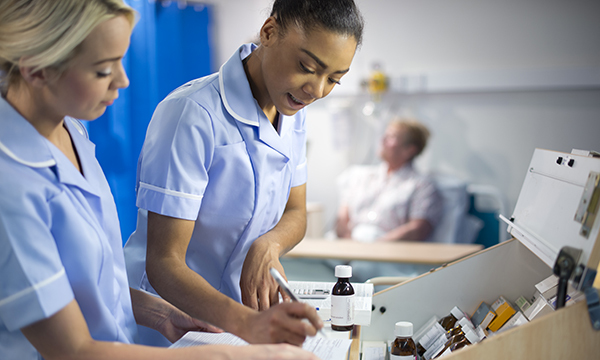 ‘Enormous’ pay gaps between white and black and minority ethnic (BME) nurses in England reflect a lack of diversity at senior levels in the NHS, the RCN has said. Female Asian British and Asian nurses and health visitors earn on average £2,688 a year less than their white colleagues, and male Asian British and Asian nurses earn £2,720 less. Female black British, African or Caribbean nurses and health visitors earn on average £2,280 a year less than their white colleagues, while male black British, African or Caribbean nurses earn £1,884 less. RCN acting chief executive Donna Kinnair said: ‘As a black woman who spent a career in NHS nursing, nobody feels stronger about this than me. ‘For the first time these figures show the scale of the challenge we face to ensure BAME [black, Asian and minority ethnic] staff are represented at every level of our healthcare system. ‘The enormous pay gaps highlighted here reflect the lack of diversity at senior levels in the health service. BAME staff make up 25% of the NHS workforce, yet this dwindles to just 7% of senior managers. Professor Kinnair added: ‘The RCN has recently welcomed moves to strengthen the ‘fit and proper person’ test, to help ensure NHS managers act positively to root out discrimination. Middlesex University business school research fellow Roger Kline has been a key figure in collecting data and evidence detailing discrimination in the NHS workforce. In 2014 he published the influential ‘Snowy White Peaks’ of the NHS report into discrimination in NHS leadership, in which he stated that some organisations showed a ‘glacial’ pace of change.